Americans have exported many things… and Halloween at Tokyo Disney Resort is one of them. 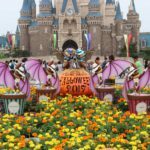 Not traditionally celebrated in Japan, Halloween at Tokyo Disneyland and Tokyo DisneySea is a unique experience for visitors and locals alike. 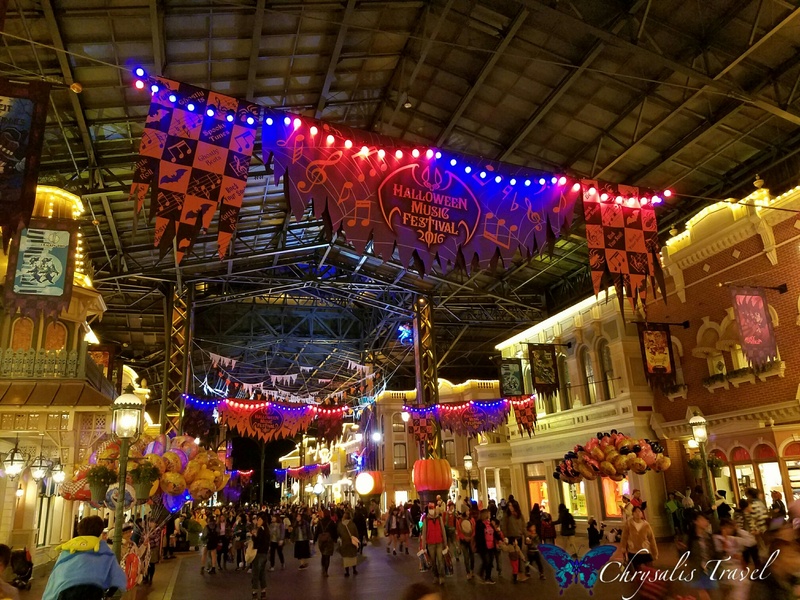 Join us as we share our Halloween experiences at Tokyo Disneyland (Part 1 of this article) and Tokyo DisneySea (Part 2). 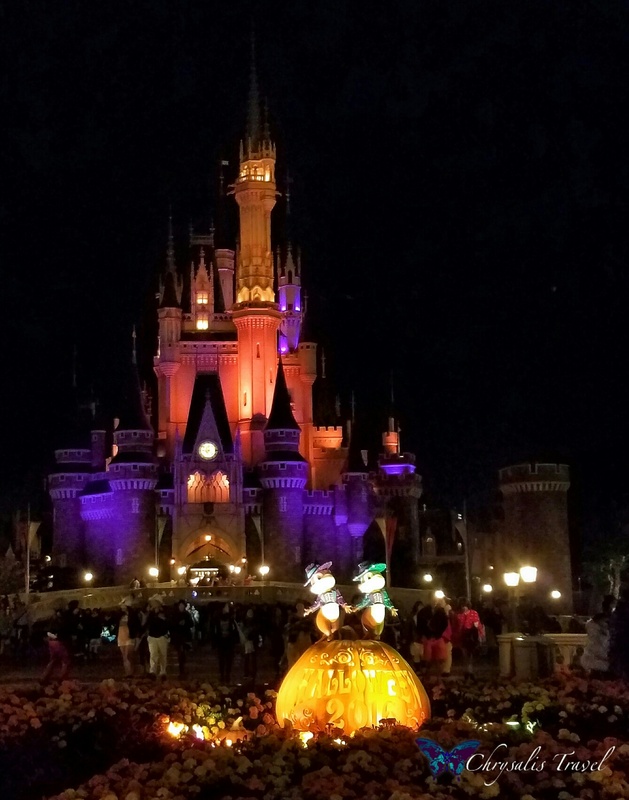 There are many delightfully Disney similarities, but also some differences that may fascinate Disney fans. 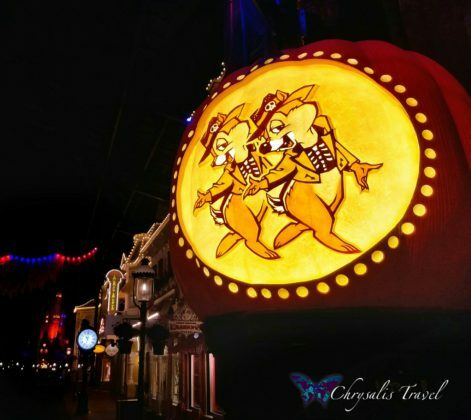 Unlike domestic Disney parks, there is no separately-ticketed event for Halloween celebrations. Everything is included in the day-ticket price. 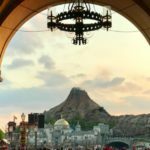 If you know the dates you want to visit Disneyland / DisneySea, it is advisable to purchase your tickets online ahead of time, as tickets are known to sell out for the parks. 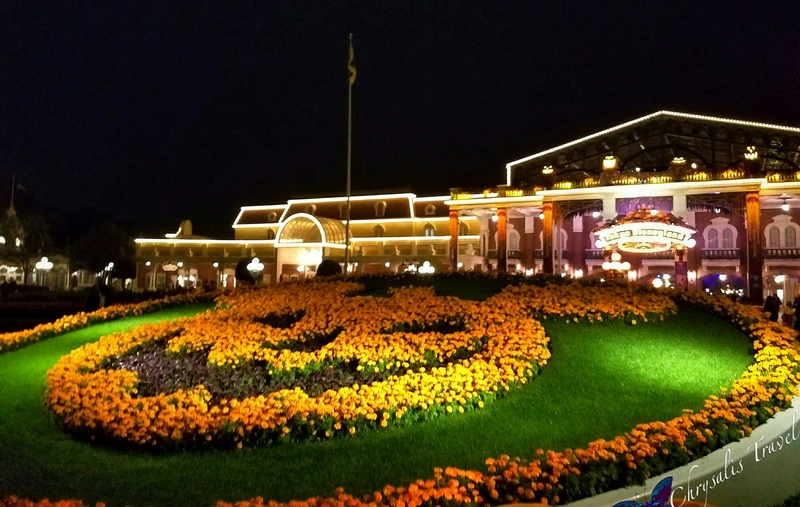 Even annual passholders are not guaranteed entry when parks have reached capacity. 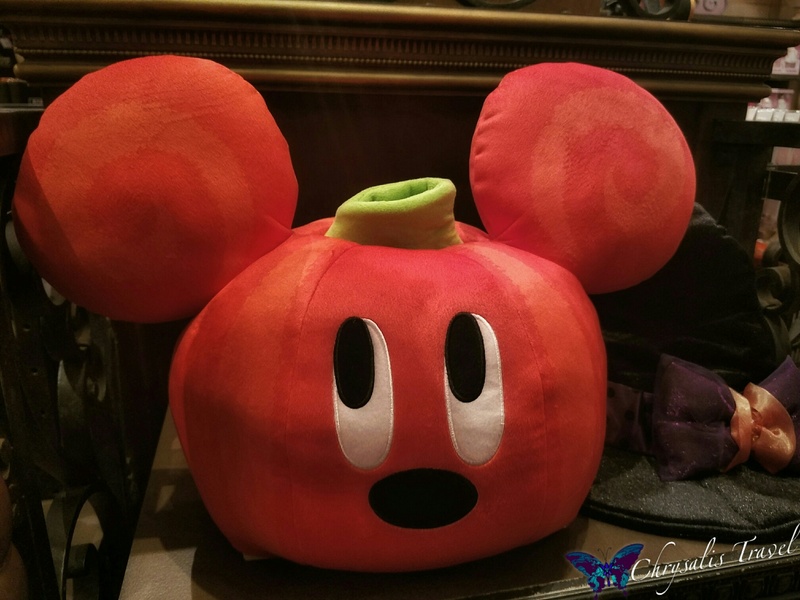 A beautiful floral Mickey-shaped Jack-o-lantern greets guests at the main entry to Disneyland, just outside the World Bazaar. (The World Bazaar replaces Main Street USA, and is a covered shopping arcade). Orange and purple lights strung across the World Bazaar, with banners reflecting the musical theme. The central intersection featured four large pumpkins featuring Mickey/Pluto, Minnie/Daisy/Clarice, Chip/Dale, and three ghost musicians. While we did not hear a band playing (we arrived in the evening to Disneyland after our flight), the musical theme suggests various entertainment throughout the day. Store windows in the World Bazaar added to the festivities. The main audience for Tokyo Disney is the twenty-something Japanese female. 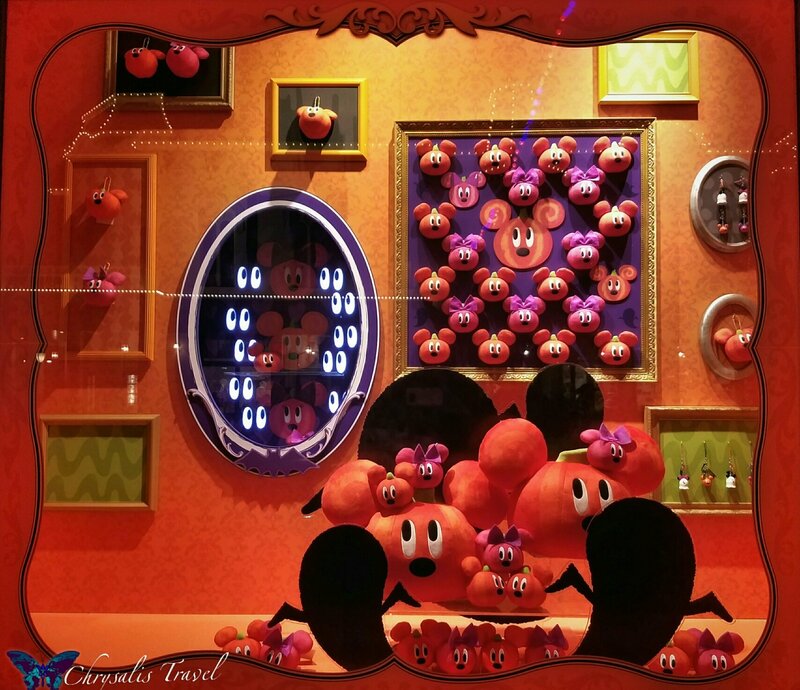 About ninety percent of the visitors to Tokyo Disney Resort are Japanese locals. 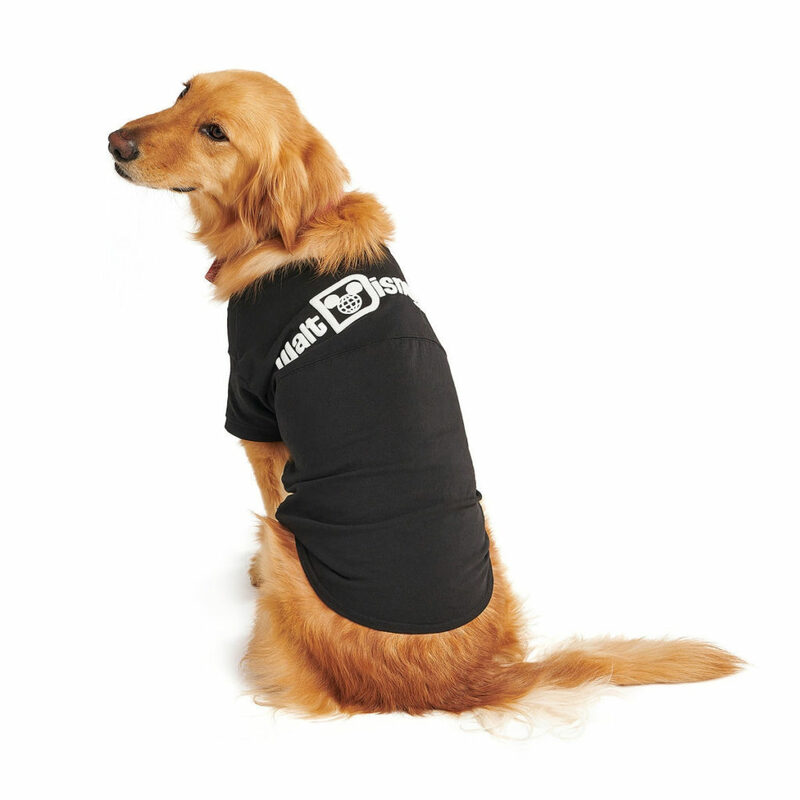 Merchandise, Disney characters, and store displays cater toward this target audience. Therefore, everything is amazingly cute. 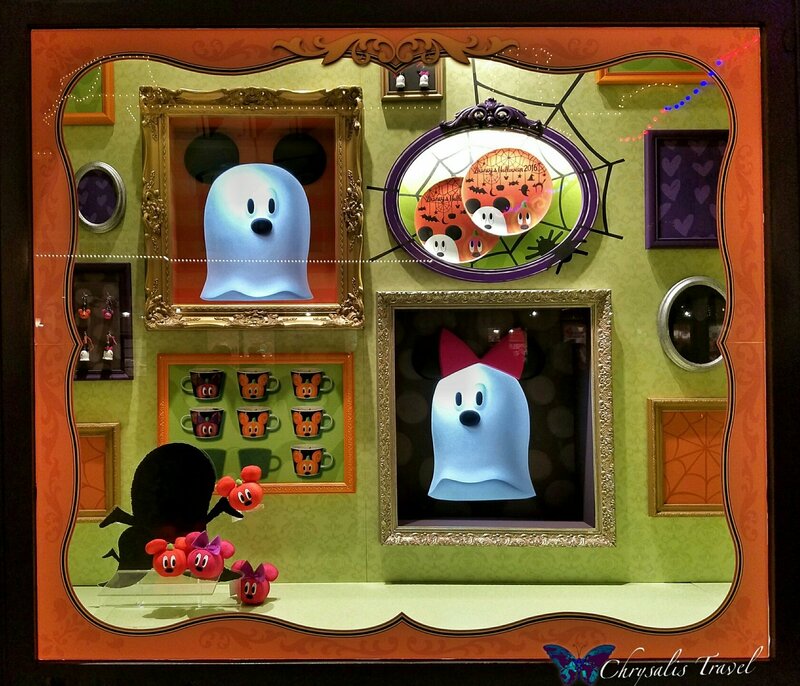 Some of the main characters seen in merchandise were the Mickey and Minnie white-sheet ghosts. 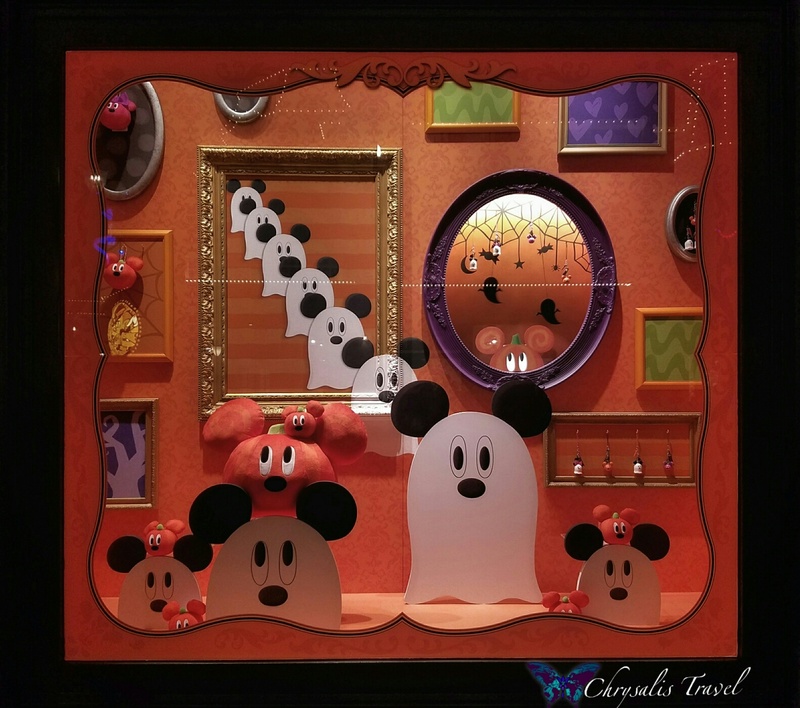 Here are three store windows featuring the Mickey and Minnie ghosts, and Mickey and Minnie pumpkin heads. The white eyes in the pumpkin window would turn on and off. The white ghosts in this window follow you around (like the Haunted Mansion busts). 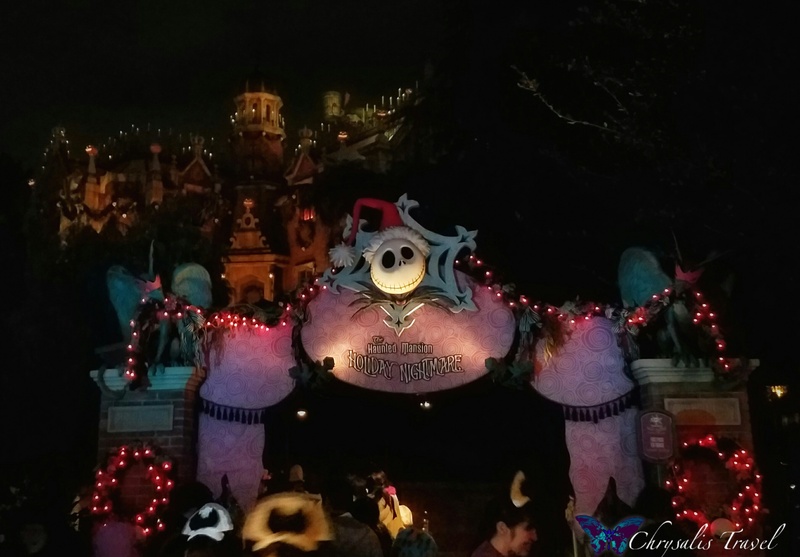 Tokyo received the seasonal overlay when WDW’s near-identical Haunted Mansion passed on Jack’s install. 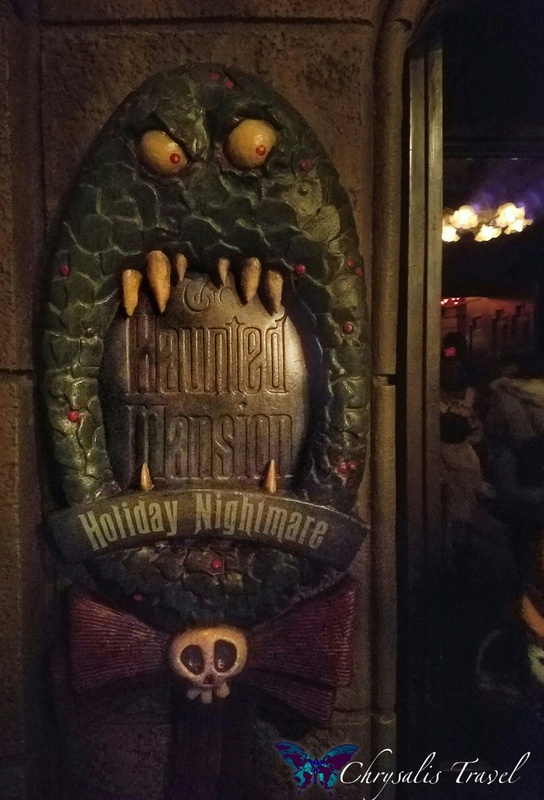 So here we have a unique combination of Nightmare Before Christmas (unique to Disneyland Anaheim, stateside) in WDW’s Haunted Mansion layout. 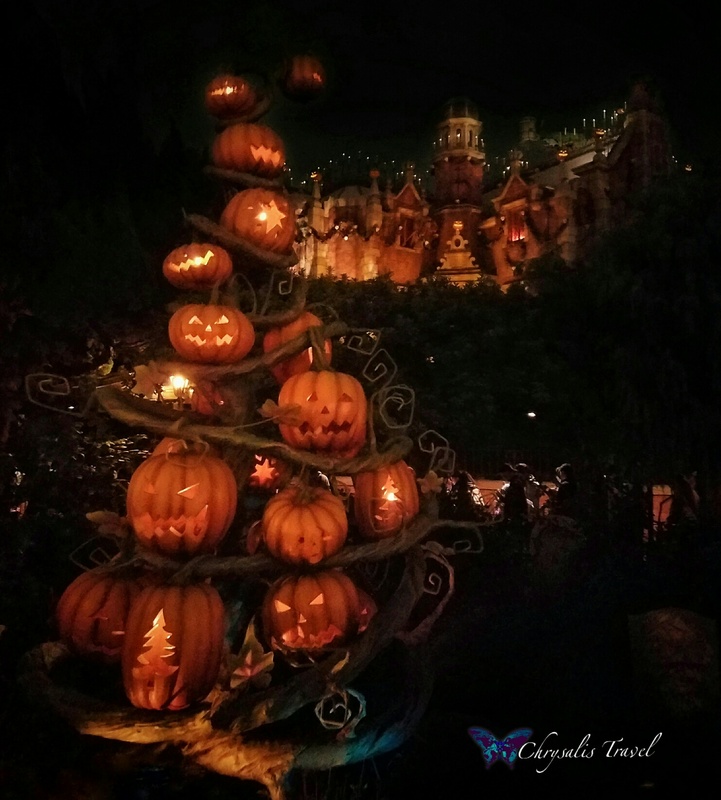 A Jack-o-lantern tree creates a festive welcome for the queue entry. 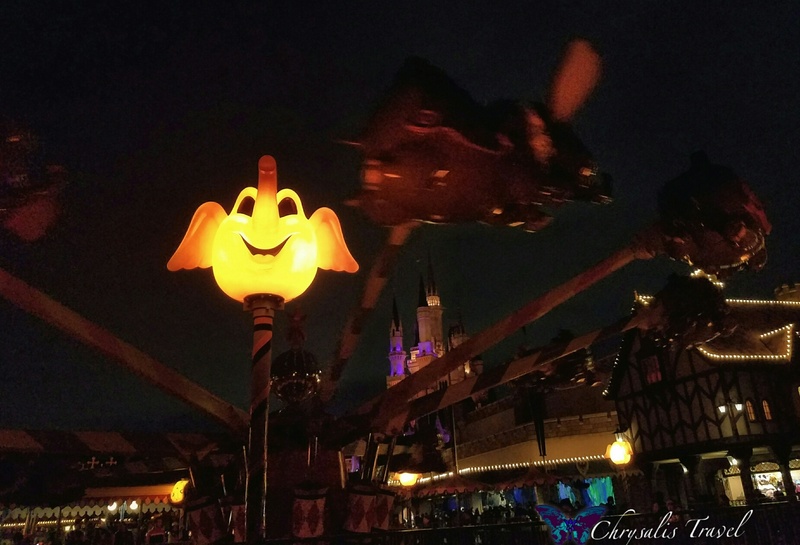 Flickering pumpkins light the brick attraction building on the hill. 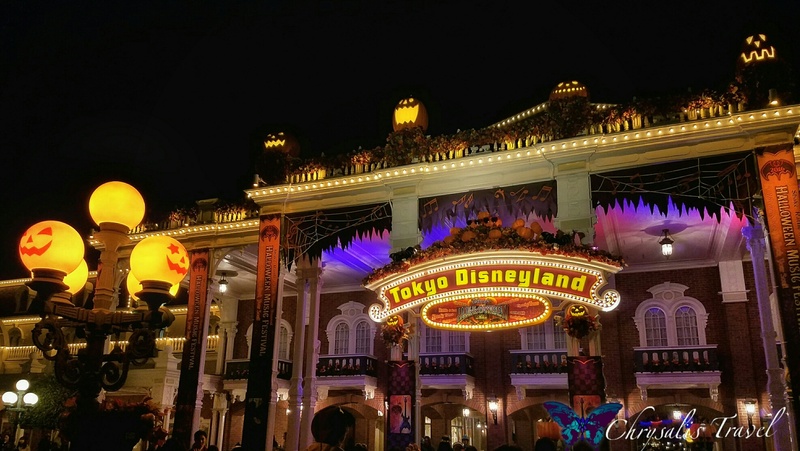 While Tokyo’s Haunted Mansion ride building resembles the Orlando mansion in style, it has distinctively unique brick architecture. Danny Elfman’s familiar music serenades guests through the queue. 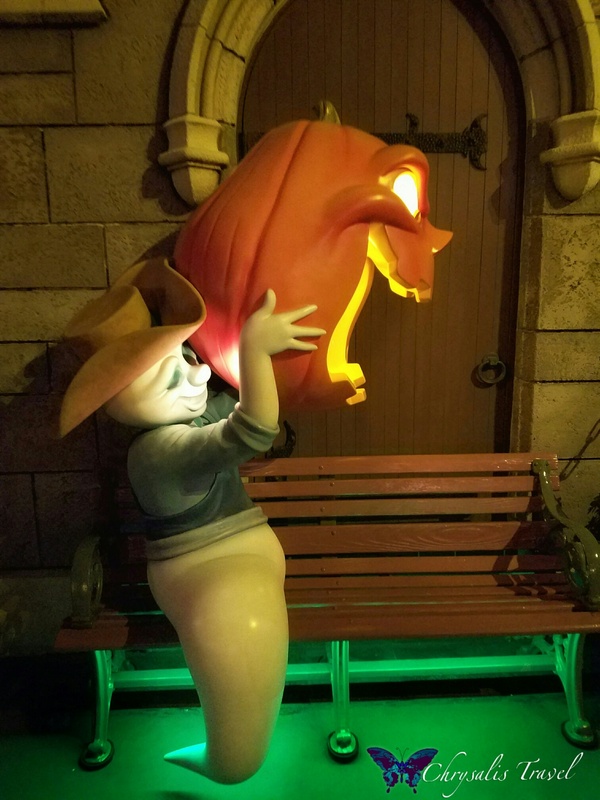 Disneyland’s Jack-o-lantern scarecrow is tucked into a far corner of the queue. 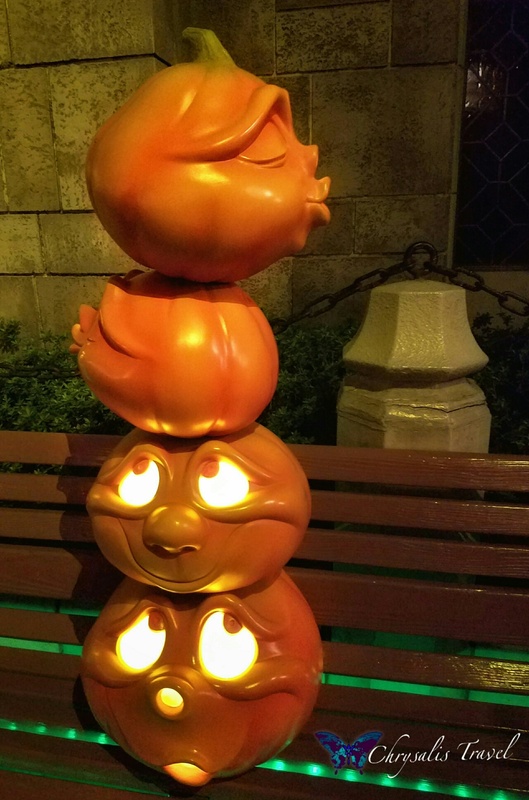 Multiple other Jack-o-lantern ‘snowmen’ guide guests through indoors and outdoors. 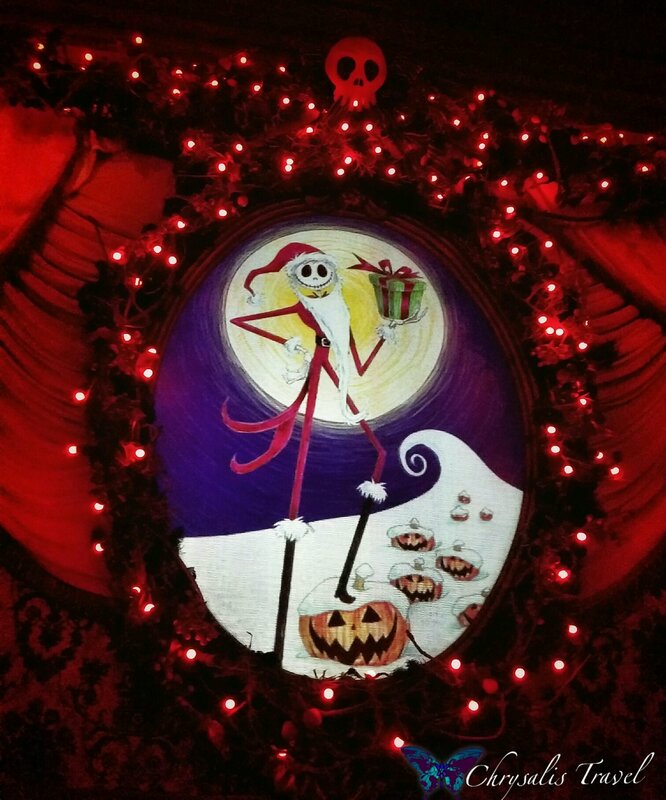 The photo above the fireplace mantle is now animated with Jack in various stages of Halloween / Christmas. Orange strings of lights adorn the halls. Entering the stretching room, you see the familiar stained glass of each portrait. Instead of Disneyland’s New Orleans style mansion, one of the stained-glass panels portrays Tokyo Disneyland’s brick mansion. The stretching room, true to Florida form, is not an elevator; the carpet continues from foyer. The narration is entirely in Japanese, in a voice very similar to Jack’s. At the end of the stretch, Jack’s familiar face flashes above the faux ceiling (wishing everyone Happy Holidays in English, in a voice that is not Jack’s). 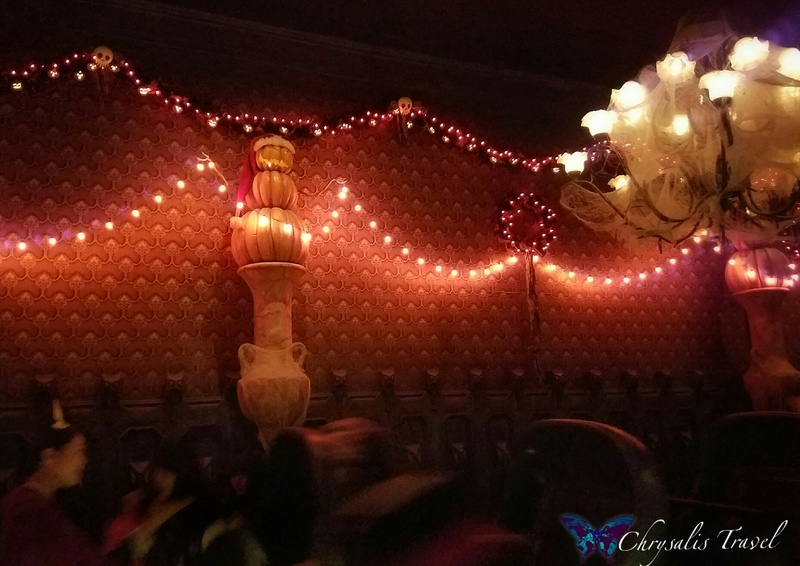 The door opens and guests walk through the halls, decked with pumpkins and orange strings of lights. The familiar funnel narrows onto the moving walkway where guests board their Doom Buggies. Scary Teddy plays quite a complicated piano piece as Sally sits, entranced, in the conservatory. 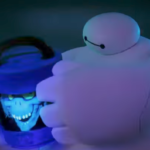 Sally’s mug has Jack’s face on it, and the small tree is lit with tiny jack-o-lanterns that resemble Zero’s nose. 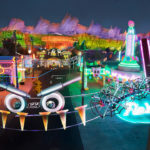 At Disneyland Anaheim, Zero appears down the disappearing hallway, and with Jack in the graveyard scene. In Tokyo, Zero does a great job trimming the tree in the library with the ghost busts. The ballroom scene has Zero floating near the chandelier. 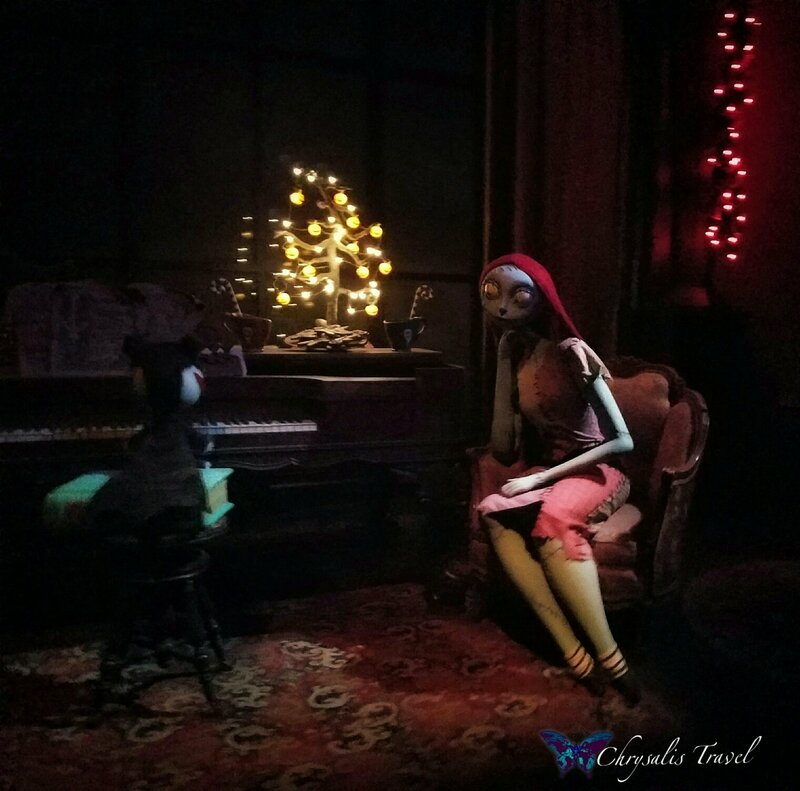 Jack and Sally’s silhouettes fill the window beneath the two duelers (instead of a Christmas tree). The attic snake chews up the Naughty and Nice List, customized with Japanese and traditional English names on it. The graveyard scene is very similar to the one at Disneyland, sans Sally. 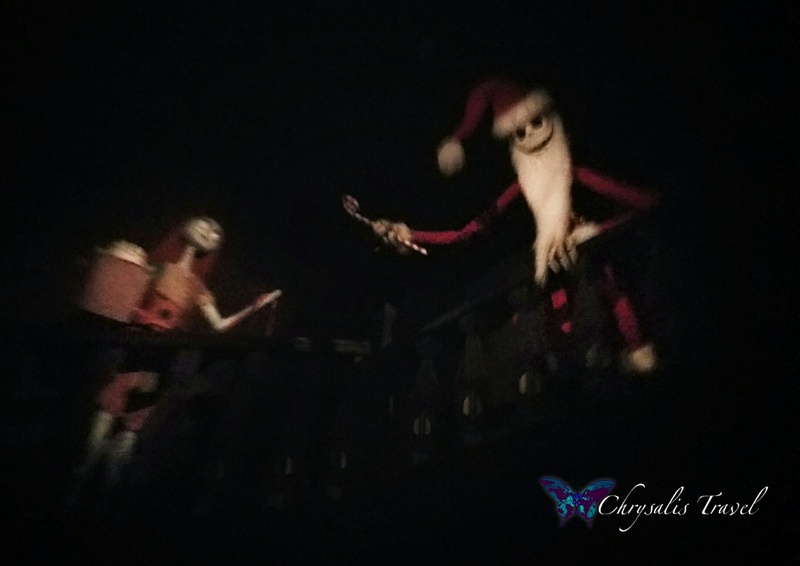 Overall, there were more Sally, Jack, and Zero animatronics in this Japanese Haunted Mansion Holiday Nightmare. 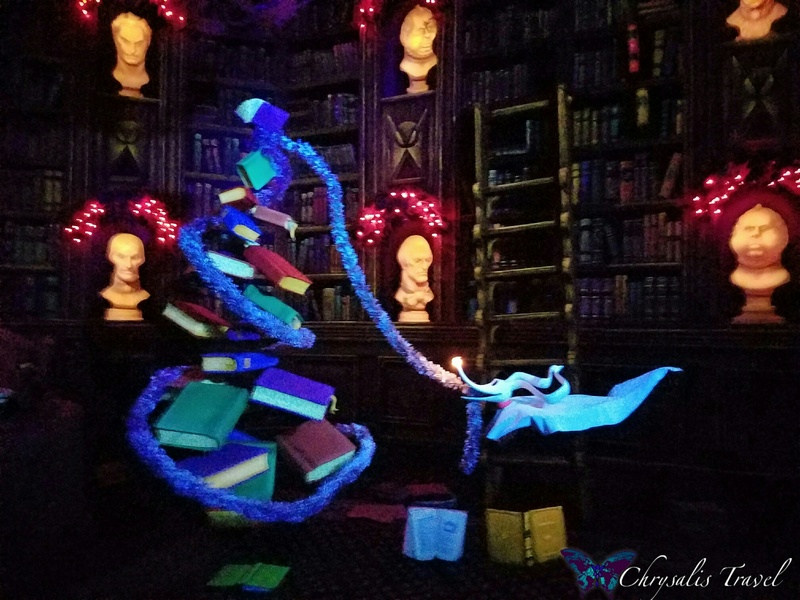 It was so unique seeing Disneyland’s Nightmare Before Christmas interpreted for the Disney World ride layout. 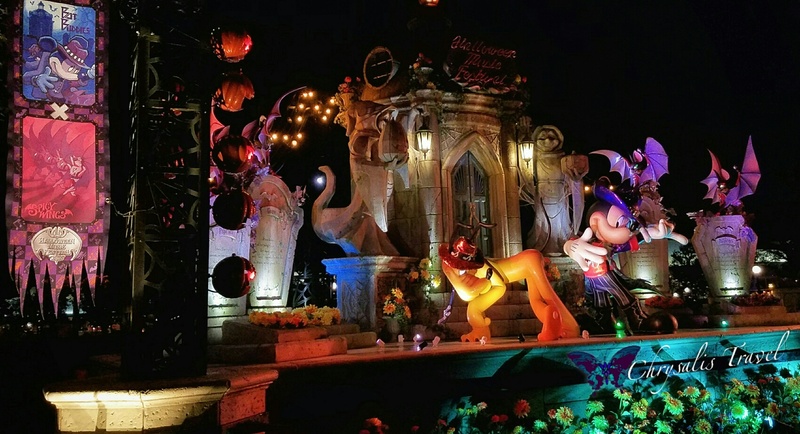 The Haunted Mansion — with Jack’s 999 Happy Haunts — reside in Fantasyland at Tokyo Disneyland. 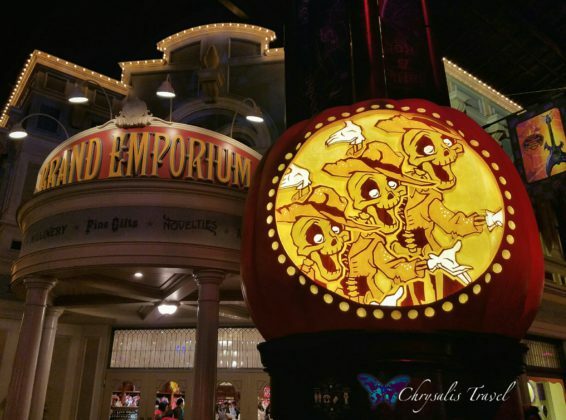 Orange ‘elephants on parade’ pumpkins also decorated the Dumbo attraction. Several other animated Halloween pumpkins were seated on park benches behind the Castle. These pumpkins invite you to sit and smile. 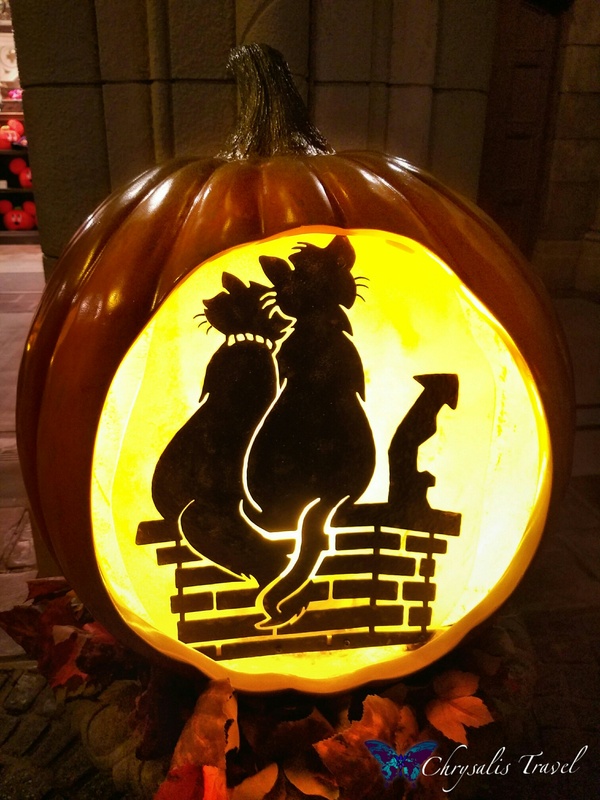 Aristocats cuddle on this pumpkin behind the Castle. Popcorn carts are festive too. 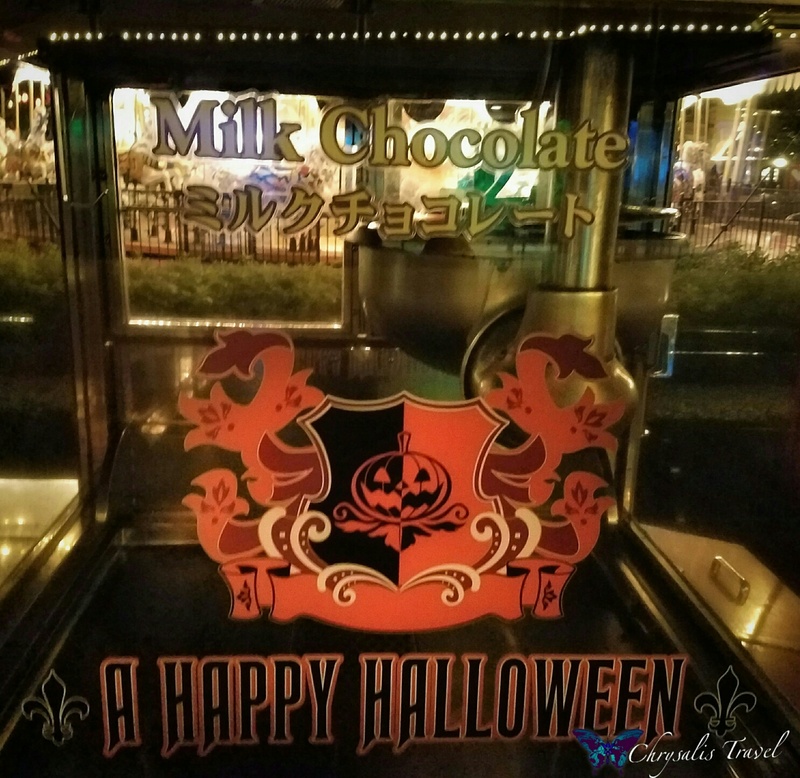 Besides sporting Halloween signage, Tokyo popcorn carts feature many distinct flavors not available in our domestic parks. Milk chocolate popcorn is actually delicious! 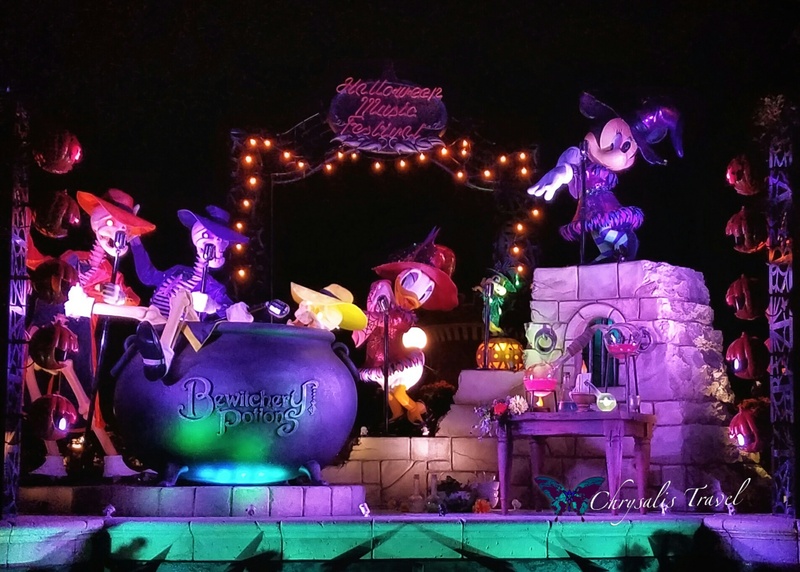 Two large displays on either side of castle feature Mickey and Pluto with their Bat Buddies, and Minnie, Daisy, and Clarice (Chip and Dale’s female friend) making Bewitchery potions. Lighting changed constantly on these displays, creating multiple different effects for these static characters. 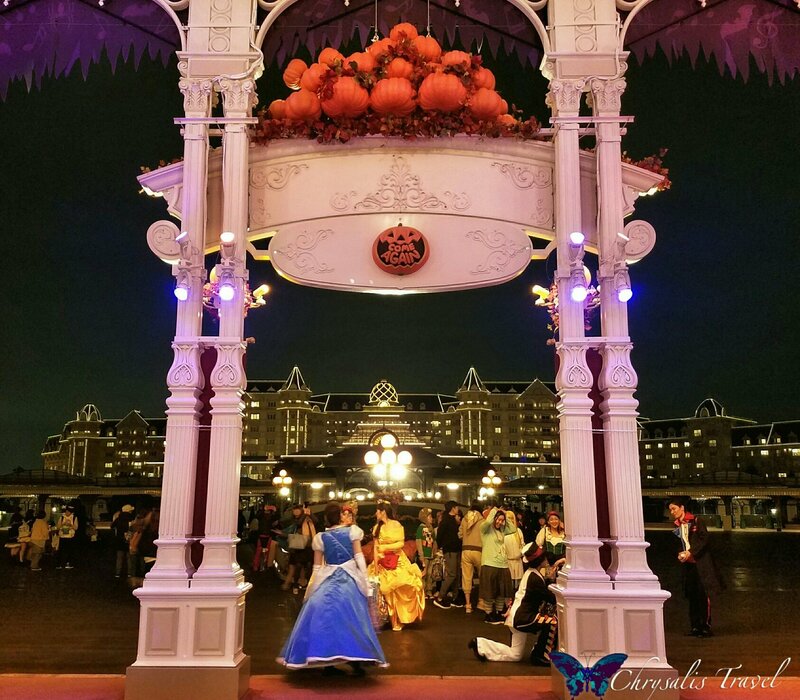 The Halloween Parade is a day-time parade, since it is not a separate ‘Halloween party.’ All guests are welcome to enjoy the cute, not-scary parade of favorite Disney characters. Tissue box holders are not common items domestically. The orange pumpkin Mickey is actually quite large, and dispenses tissues from the top stem. Tiny candy holders are also popular. 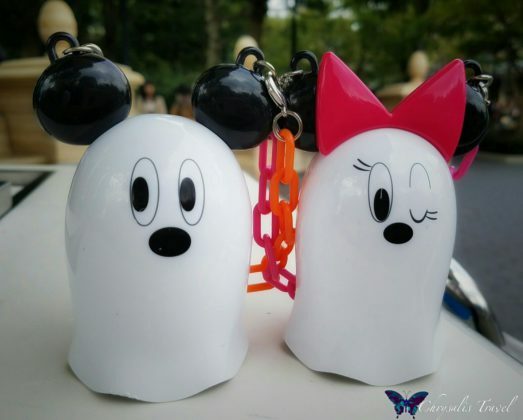 These Mickey and Minnie ghosts hold your choice of jelly beans or chocolate candies. After a long day at Tokyo Disneyland, guests gather for last photos under the resort sign. 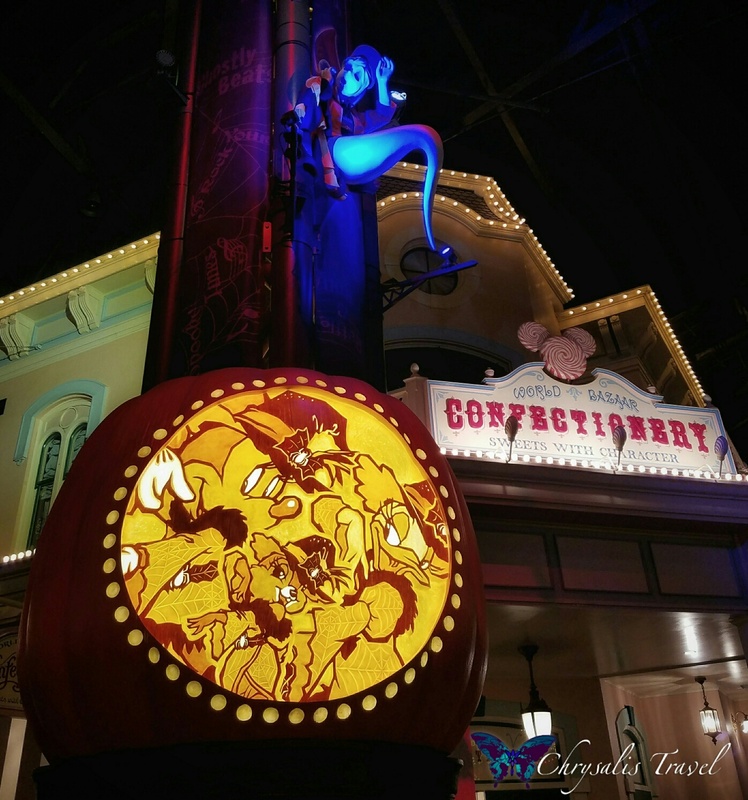 A pumpkin invites guests to ‘Come Again.’ The lights of the Tokyo Disneyland Hotel are outlined directly across from the park. 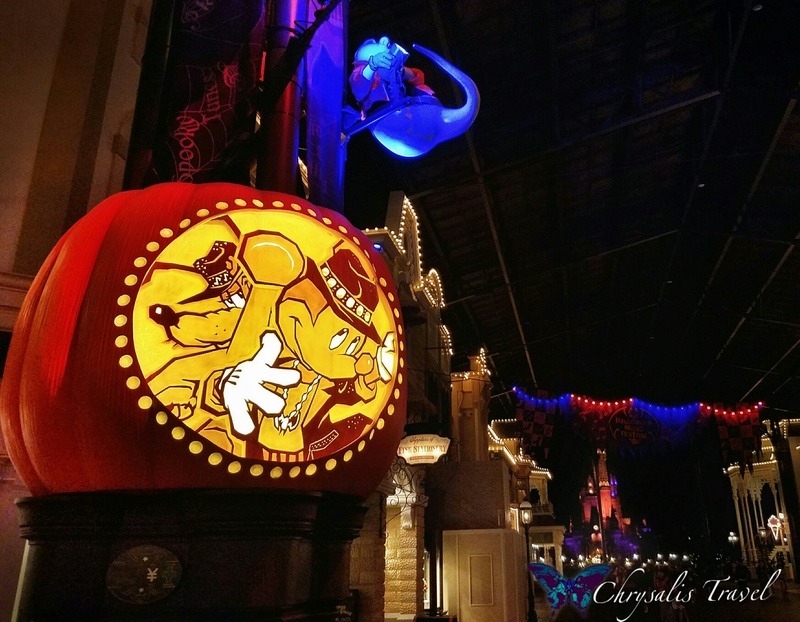 What did you find interesting about Tokyo Disneyland’s Halloween? We would love to know!